Scissors or shears are hand-operated tools made from 2 sharpened steel or aluminum blades that are pivoted so they pass against each other when the handles (bows) close. The earliest ones appeared 3,000 to 4,000 years ago in Mesopotamia, were forged in bronze and resembled the thread nippers we use today. These spring scissors continued to be in use throughout Europe into the sixteenth century, but the Romans invented the pivoted style which became the precursor to our modern instruments around AD 100. The difference between “scissors” and “shears” is length and design of the handles. 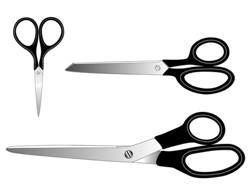 Scissors are smaller than 10” with two identical handles while shears are 10” or longer with one rounded bow for the thumb and a longer more elliptical bow for two or more fingers. Home sew-ists generally prefer the 10” bent handle shears while a 12” heavier pair is the popular choice for professional dressmakers and tailors. Most scissors and shears are manufactured for right hand use, but both left handed and ambidextrous models are readily available. Spring action shears with soft, padded handles have become popular for both right and left handed use as well as for those with arthritis or other hand concerns. Pinking shears designed with notched or scalloped teeth produce a saw-toothed cut that prevents raveling of loose weaves, aids in quickly grading seam allowances on certain garments or adds a decorative touch to the edges of fabrics that won’t ravel, such as polarfleece. Shears with micro-serrated blades work well on thin, sheer or slippery fabrics to ensure a perfect cut. Some shears are coated with a finish that resists corrosive materials and sticky adhesives. Rotary cutters have gained popularity in recent years for both speed and accuracy. They resemble a pizza cutter and are available in several styles and sizes of handles with small or large blades. Changeable decorative blades are accessible for variation. A rigid or self-healing cutting mat that comes in many sizes is necessary when using a rotary cutter. Less pressure is required on the rotary cutter when using a rigid mat since it’s less porous than a self-healing one in which the blade will sink slightly into the mat. Always use a sharp blade and be careful to engage the blade cover when not in use. When cutting with shears, lightly hold your free hand on top of the pattern that has been pinned or weighted to the fabric and cut with the shears close to the edge of the pattern paper, moving your hand as needed without distorting the fabric beneath the pattern. Do the same when using a rotary cutter, but begin your cuts at the top and bottom of each pattern, then do the vertical cuts, such as side, back or front seams. This helps eliminate fabric distortion as you cut. Use a smaller rotary blade for tighter areas or switch to shears which should be used to cut out notches, etc. Try to move the blade continually along the cutting line for smoother edges. For straight lines, a metal or heavy plastic ruler or yardstick placed along the cutting edge is suggested for safety as well as a perfect cut. Cutting equipment is probably the most used sewing item and should be purchased and handled with care. It’s imperative to “test drive” a good pair of scissors or shears to decide on the proper weight, size and model that will be most comfortable for you. Sharpening tools are sometimes included in the purchase, but using a reputable professional to keep your scissors and shears in excellent condition is well-worth the price. For more information about scissors, shears and rotary cutters, visit the SEW-lutions Guidelines page and look under Section 1, Sewing Tools.